AP Sumative Assesment Test 2 SA-2 Class 6th,7th,8th,9th All Subjects Medium wise Telugu/English /Hindi/ Maths/Physical Science PS/Biological Science NS/Social Studies (Paper 1/Paper 2 ) Principles of Evaluation Answers Key Download/AP SA II/SA 2 VIth,VIIth,VIIIth,IXth Sumative Assesment Test II All Subjects Medium wise Telugu/English /Hindi/ Maths/Physical Science PS/Biological Science NS/Social Studies Principles of Evaluation March 2018 Download/ AP SA-2 March 2018 All Subjects Medium wise Telugu/English /Hindi/ Maths/Physical Science PS/Biological Science NS/Social Studies Principles of Evaluation,AP SA-II March 2018 All Subjects Medium wise Telugu/English /Hindi/ Maths/Physical Science PS/Biological Science NS/Social Studies Principles of Evaluation Answers Key Download/AP SCERT Maths Answers Key Sheet Summative Test 2/SA II Principles of Evaluation for 6th,7th,8th, 9th Class All Subjects Medium wise Telugu/English /Hindi/ Maths/Physical Science PS/Biological Science NS/Social Studies Pricipales of Evaluation Download/AP SA 2 All Subjects Medium wise Telugu/English /Hindi/ Maths/Physical Science PS/Biological Science NS/Social Studies Answers Key Sheet March -2018 All Subjects Medium wise Telugu/English /Hindi/ Maths/Physical Science PS/Biological Science NS/Social Studies Principles of Evaluation Answers Key Download. 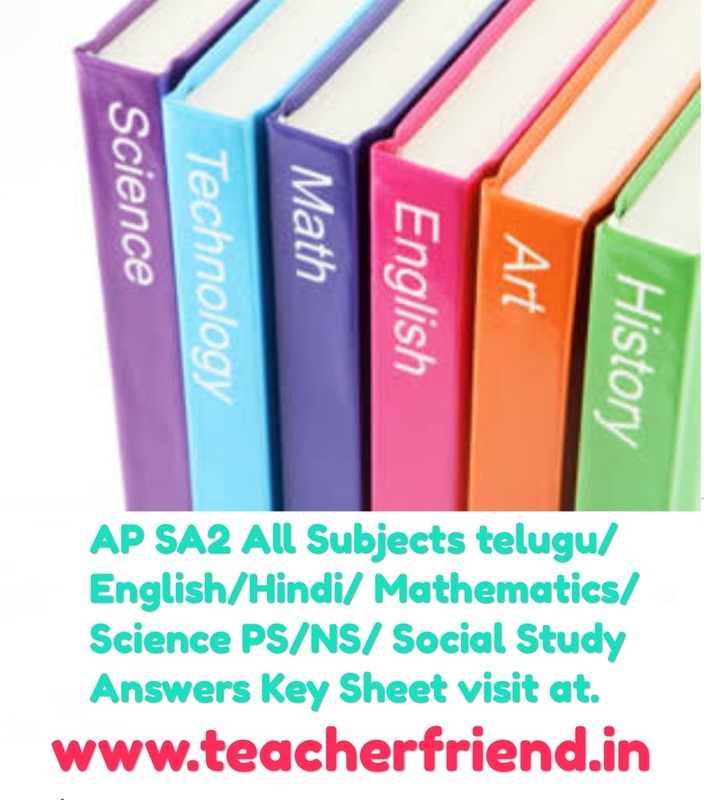 SA-2 March 2018 All Subjects telugu/English/Hindi/ Maths/Science PS/NS/ Social Studies Principles of Evaluation Answers Key Download, Summative Assessement 2/Sumative-2 (SA II)/SA 2 All Subjects Answers Key Sheet Summative 2 Principles of Evaluation for 6th,7th,8th, 9th Class (All Subjects telugu/English/Hindi/ Maths/Science PS/NS/ Social Studies Principles of Evaluation for Social Summative Assessement Test - 2 / SA -2 (SA-II) 2018 March Answers for VIth,VIIth,VIIIth, IXth class wise All Subjects telugu/English/Hindi/ Maths/Science PS/NS/ Social Studies Summative Assessement 2/SA2 2018 March Principles of Evaluation,Sumativ Assesment test-2 (SA-II) All Subjects telugu/English/Hindi/ Maths/Science PS/NS/ Social Studies Key Sheet Download. Read:Get Download Telugu SA2 Principles of Evaluation Click Here. Read:Get Download Hindi SA2 Principles of Evaluation Click Here. Read: Get Download English SA2 Principles of Evaluation Click Here. Read: Get Download Maths SA2 Principles of Evaluation Click Here. Read: Get Download Science SA2 Principles of Evaluation Click Here. Read: Get Download Social SA2 Principles of Evaluation Click Here.